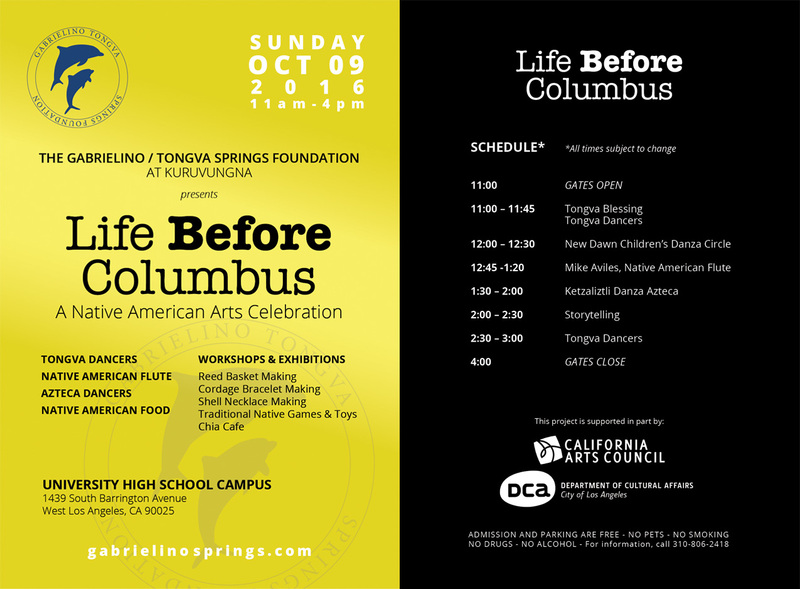 Come with us to the Tongva Springs for a fun and educational day of Native American culture and history the day before Columbus Day. We will have Native food, arts and fun learning experiences for everyone. All are welcome! 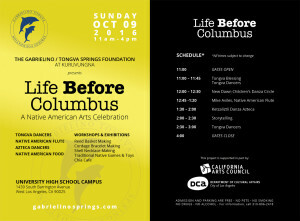 Join us as we remember and celebrate “Life Before Columbus”! Please refer to the flyer below for more information on this annual event. Azteca Dancers, Celebrating Life, Columbus Day, Gabrielino Tongva Tribe, Kuruvungna Springs, Life Before Columbus, Los angeles, Moving forward while honoring the past, Native American Celebration, Native American Food, Santa monica, Tongva Dancers, Tongva Nation, Tongva Springs Foundation. Bookmark.